Even before this large-scale influx of refugees, Malaysia is already one of the top destinations for refugees in South East Asia region with a total of 250,930 population of concern including 115,700 refugees and others such as asylum seekers, stateless people and so on. As of now, we lack legislative and administrative framework to address refugee problem. UNHCR working relationship with Malaysian government is only limited to the prevention of deportation and detention intervention. Refugees recognized by the UNHCR are only allowed to work unofficially (usually extremely low-pay) and the children of refugees are not allowed to go to national schools. Such circumstances if not addressed properly will soon bring social problems such as more stateless children, poverty, and criminality. Since Malaysia did not sign 1951 UN Convention on Refugees nor 1967 Protocol to recognize the rights of refugee, current government policy is to accept refugees into the country only temporarily while waiting for their resettlement at third countries including Australia, Canada, Czech Republic, Denmark, New Zealand, Norway, and the United States. The “can’t see can’t hear” system is framed in such a way as if the refugee don’t exist in the country. Nevertheless, it was reported that the number of places available for resettlement in third countries for the refugees in Malaysia is shrinking rapidly. Coupled with this current wave of refugee influx, we believe that the population of refugees in Malaysia will continue to grow and they will stay here for a long time. 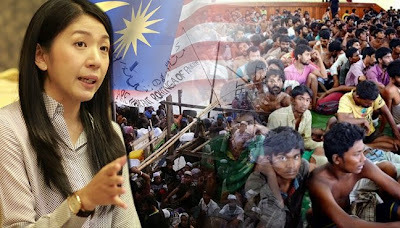 The question now is can Malaysia refugee policy remain status quo in the face of the rising number of refugees? Should we recognize the status of refugee and their rights? What cross-boundary solutions should we advocate? How can we get the funding from the international community to help with refugee management in Malaysia? Can the refugees in Malaysia continue to hold no or extremely low-pay job, live in poor conditions and yet not pose safety problem to us? Can the children of refugees continue to be deprived of formal education? How can we protect the women refugee from sexual exploitation? These are some pertinent questions that we’ll eventually have to answer. It’s better that we do now than later. We believe that refugee issue in Malaysia can be handled more comprehensively and the government can assume greater responsibility to help with the current efforts made by UNHCR and NGOs. With that, we call upon the government to form a non-partisan refugee committee comprising of representatives from both sides of the political divide, relevant NGOs and international organizations such as UNHCR to spearhead reform in legislative and administrative framework to deal with issues related to refugees.